British Prime Minister Theresa May warned her divided party on Sunday that there may be “no Brexit at all” if they wrecked her plan to forge a close relationship with the European Union after leaving the world’s biggest trading bloc. Linking the fate of Brexit to her own survival in such an explicit way indicates just how precarious May’s position remains after her government was thrust into crisis and U.S. President Donald Trump publicly criticized her Brexit strategy. With less than nine months to go before the United Kingdom is due to leave the EU on March 29, 2019, the country, the political elite and business leaders are still deeply divided over whether Brexit should take place and, if so, how. May doesn’t yet have a Brexit deal with the EU so the British government has stepped up planning for a so called “no deal” Brexit that could spook financial markets and dislocate trade flows across Europe and beyond. 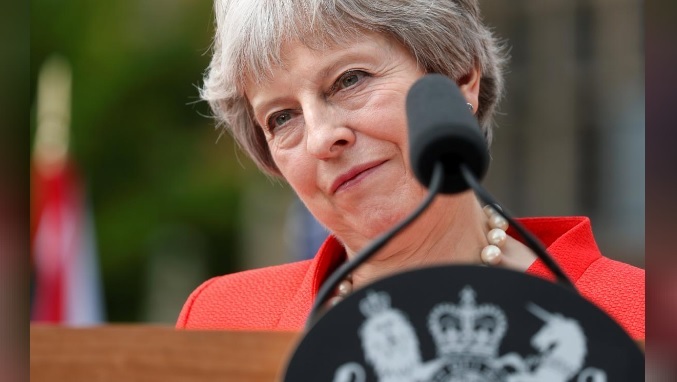 In an attempt to forge a balance between those seeking a smooth Brexit and those who fear staying too close to the EU’s orbit would undermine the very nature of Brexit, May sought the approval of senior ministers for her plans on July 6. Steve Baker, a senior lawmaker who served as a deputy to Davis in the Brexit ministry, said May had presided over a “cloak and dagger” plot to undermine Brexit. The Telegraph newspaper said Johnson had re-joined the newspaper as a columnist with effect from Monday.